What would an evaluator say when she first reads your proposal? If she is looking for reasons to disqualify you, will she find them? Does your proposal contain ammunition for those on the Evaluation Committee who don’t want you to win? Evaluators are only human. Their job is hard enough and they don’t want you to make it harder for them. From my experience on many evaluation committees, here is a list of the most common mistakes that can land your proposal in the discard pile. 1. Get rid of this one, it’s neither compliant nor responsive. It’s vaporware not reality. Compliant proposals are easy to evaluate. They follow the RFP’s instructions explicitly. They use the designated numbering system, organize the document according to the prescribed table of contents and complete the forms as instructed. They provide the information to each and every question. Responsive proposals go beyond mere compliance. Responsive proposals demonstrate an understanding of the problem and the customer’s needs. They provide evaluators with insights into the problem and solution. Compliant proposals will provide all the prescribed information in the prescribed format. Responsive proposals may contain an unsolicited risk analysis, or a chapter, rather than a page, describing the project management process. Evaluators need information to help differentiate you from your competitors. Give them what they need. Explain how your offer/firm differs from the competition. Outline who your competitors are and how they position themselves in the marketplace. Detail the key discriminators between benefits of the various features you’ve described as opposed to theirs. Most importantly, play up your strengths. 3. I can’t locate specific information. It’s not clear where various issues/items are addressed. By the time I locate each required answer, I’ll have to spend an extra hour on this proposal. Well organized proposals are easier to navigate and it’s easier to find specific answers. Evaluators get frustrated when they can’t find answers and after a short time stop looking and score the proposal lower than one that is easy to follow. Proposals that announce a specific organization and then follow it do much better. 4. Much of this proposal is boilerplate. They obviously didn’t bother looking at our specific requirements. Their proposal reads like a solution looking for a problem. I won’t be their advocate if there is any other fully responsive and responsible solution. Boilerplate should be tailored to fit the RFP and the proposal. It should be disguised so the evaluators look on it as original material. Doing a search and replace but missing a variation on a key term or name hurts your efforts. Failure to replace “the Government of Alberta” with “the University of Ottawa” will impact on your score. You are announcing to the evaluators that you really don’t care. Resumes should discuss the person’s specific qualifications as required on this project. Long, rambling resumes that provide superfluous information don’t impress the evaluators. Take the time to do it well or simply “no bid”. 5. This proposal looks like it was prepared at the last minute. There is no quality built-in and if they take the same approach to the project, we are in trouble! The diagrams are overly simplistic; they look like they were prepared using the most rudimentary of graphics packages. The format, style, margins, and type font keep changing from section to section. Obviously, this proposal was written by a group with each section being developed independently. I wonder how many contradictions I can identify I don’t think this is a serious offering. Avoid the wrath of the evaluator. Take care to review your draft proposal before it goes out the door. Organize a green team review, a small group of people to take on the task of reviewing the proposal from the perspective of the evaluator. Even if you are a one-person firm, ask a colleague to spend a few hours to play evaluator before sending it out the door. 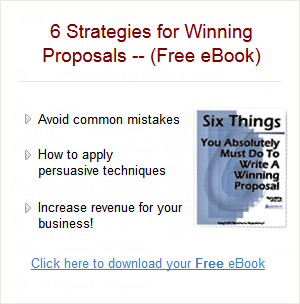 The results will be a dramatic improvement in the quality and clarity of your proposal.